Flea prevention in cats is something we recommend depending on your cats’ risk factors. Generally, we use flea prevention regularly for outdoor cats and for cats who live with dogs. We also recommend flea prevention for indoor cats that live in multi-unit buildings. You may notice your cat scratching more often; this is often the most prominent sign. You may also see little specks of dirt that look similar to flakes of pepper on your cat’s belly or in the groin area; this is more noticeable on lighter coloured cats. It is called flea dirt or flea poop. 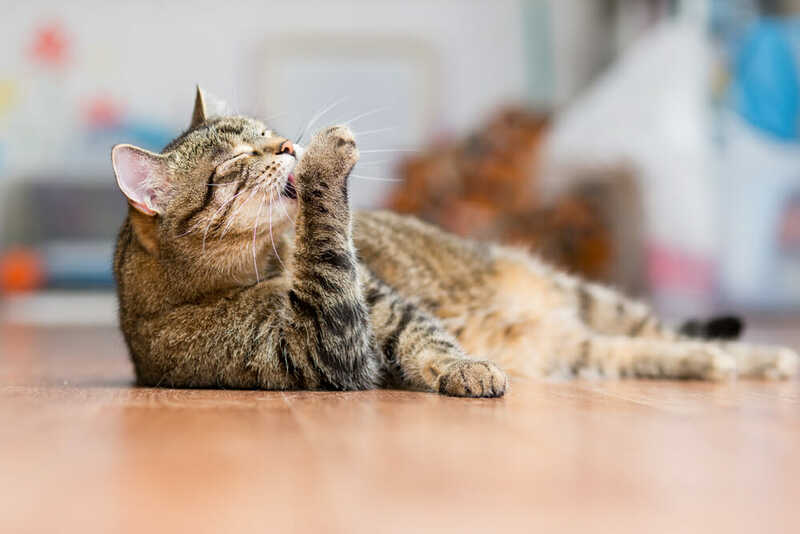 If left untreated, fleas can harm your cat’s overall health by causing skin lesions and skin irritations which can become secondarily infected. Fleas can also carry tapeworm and cats that have fleas will often have a tapeworm infection as well. Another potential consequence is the development of anemia (low red blood cells) as fleas feed on blood. To keep your cat healthy, as well as helping keep fleas out of your home. When we treat and prevent fleas, we are helping avoid lesions of skin and itchiness in your cat, and we are also helping to prevent the intestinal parasite, the tapeworm. Treating fleas in a senior cat is no different than treating any other age group of cats. Preventing fleas in a senior cat is very important as their immune system isn’t as strong as a younger cat and they are more susceptible to complications from fleas, such as anemia.